Definition at line 132 of file modules.c. References copystr(), LIST, list_new(), and r.
Definition at line 31 of file modules.c. 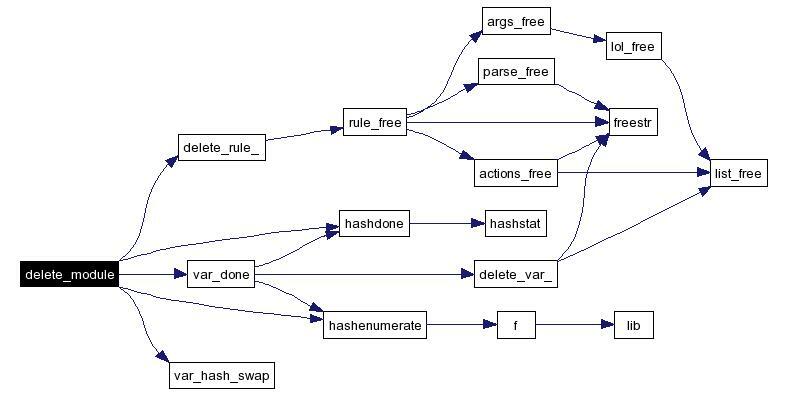 References HASHDATA, hashenter, hashinit(), m, module_hash, module_t::name, newstr(), s, string_append(), string_free(), string_new(), string_push_back(), and string::value. Referenced by builtin_delete_module(), builtin_export(), builtin_import(), builtin_import_module(), builtin_imported_modules(), builtin_instance(), builtin_rulenames(), builtin_varnames(), evaluate_in_module(), import_base_rules(), lookup_rule(), make_class_module(), root_module(), and type_check(). Definition at line 78 of file modules.c. References delete_rule_(), hashdone(), hashenumerate(), m, module_t::rules, var_done(), var_hash_swap(), and module_t::variables. Definition at line 73 of file modules.c. Definition at line 63 of file modules.c. References hashinit(), m, new_module_str(), RULE, and module_t::rules. Definition at line 105 of file modules.c. References m, var_hash_swap(), and module_t::variables. Referenced by evaluate_in_module(), evaluate_rule(), make_class_module(), swap_settings(), and type_check(). Definition at line 110 of file modules.c. Definition at line 115 of file modules.c. References HASHDATA, hashenter, hashinit(), module_t::imported_modules, LIST, _list::next, s, and _list::string. Referenced by builtin_import_module(), and import_base_rules(). Definition at line 140 of file modules.c. References add_module_name(), hashenumerate(), module_t::imported_modules, and LIST. Referenced by builtin_imported_modules(), and import_base_rules(). Definition at line 20 of file modules.c. References m, module_t::name, newstr(), s, string_append(), string_copy(), string_free(), and string::value. Definition at line 97 of file modules.c. Referenced by bind_builtin(), bindrule(), builtin_caller_module(), builtin_import_module(), duplicate_rule(), evaluate_in_module(), frame_init(), global_rule(), global_rule_name(), and swap_settings(). Definition at line 18 of file modules.c.